Congratulations to all our year 11 students on their exam results. 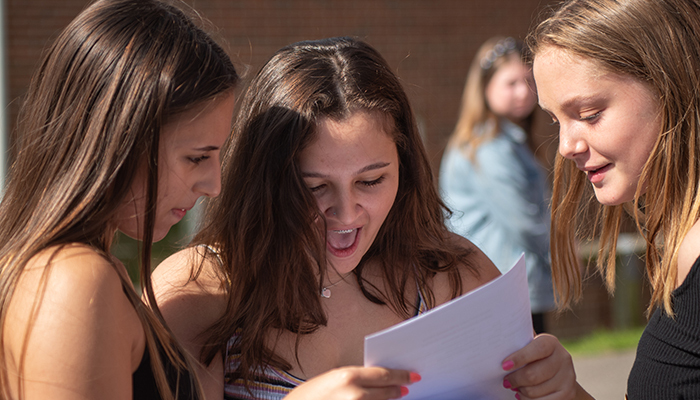 We are all incredibly proud of how well our students faced the increased demands of the reformed GCSEs this summer; their dedication and hard work have paid off with an excellent set of results. The percentage of students achieving 5 good grades, including Maths and English at grade 9-4, was 74%. English and Maths achievement was 82% grade 9-4 in English and 84% grade 9-4 in Maths, and the percentage of students achieving grade 9-4 in both Maths and English was 77%. Top grades increased, with 30% of all grades awarded being 9-7, the equivalent of A-A*, with large numbers of students excelling in a broad range of subjects at the top grades, including Art (37% 9-7), Graphics (60% 9-7), Dance (65% 9-7), ICT (47% 9-7), Music (63% 9-7). We are extremely pleased that the hard work, commitment and aspiration of our students and staff has been rewarded with excellent results and we wish all our leaving students every success as they take their next steps.